When we think about tossing steaks on the grill, we usually picture a big juicy ribeye or a porterhouse or maybe a strip, but today I want to touch on an often overlooked cut – the flank steak. For many people, due to its tougher texture, the flank steak is relegated to the slow cooker and other braising methods to produce a more tender result. 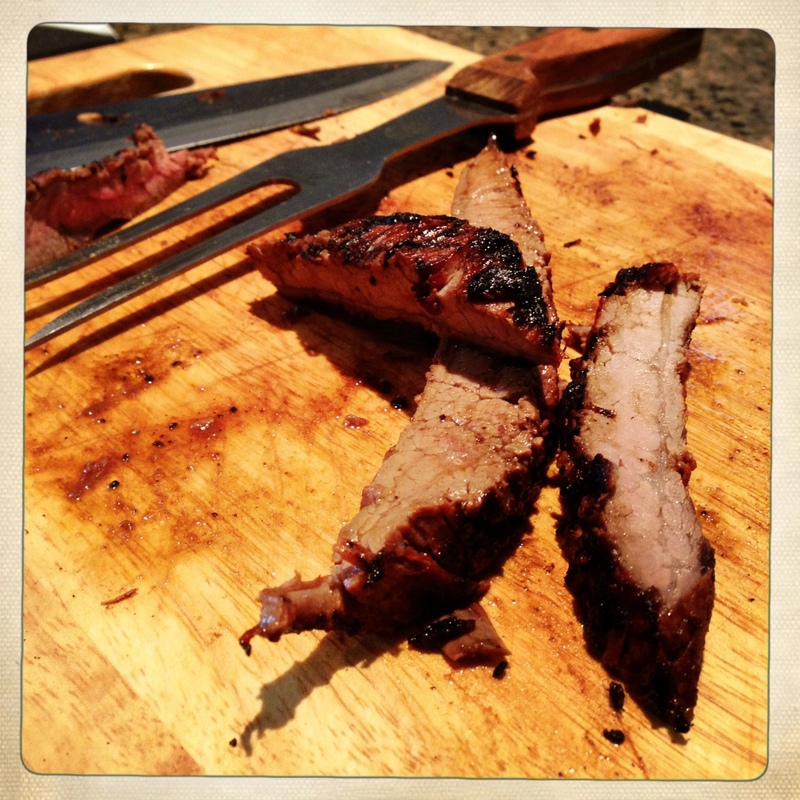 However, with proper preparation, the flank steak is actually ideally suited to the grill. 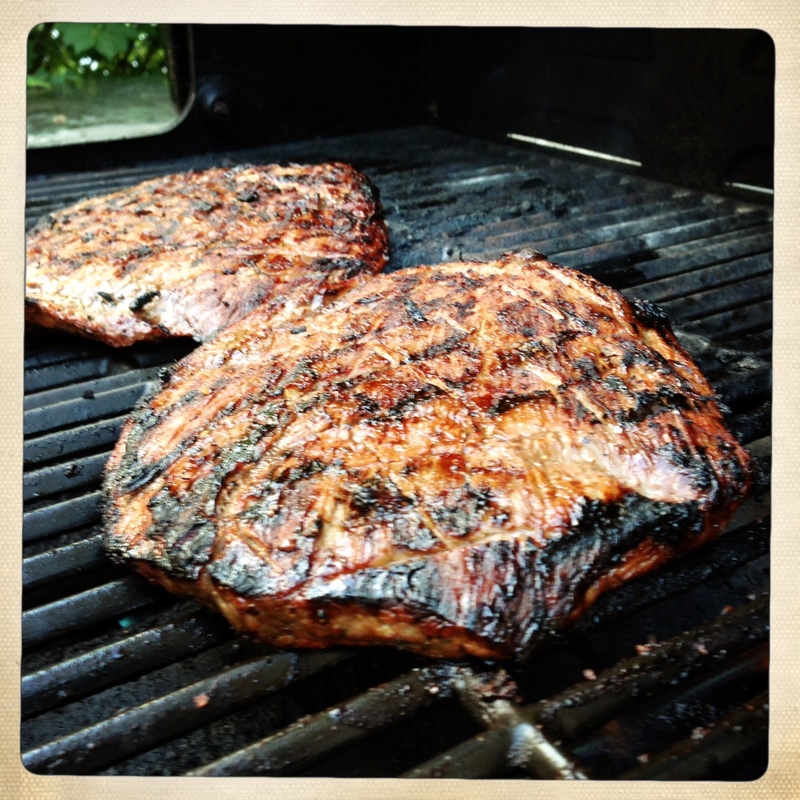 What makes the flank steak especially appealing is its versatility. It can be sliced and served on its own, of course, but it also works well sliced extra thin and made into a sandwich. One of my favorite things to do with grilled flank steak is to thinly slice chilled leftovers and use it on a salad the next day. Similar to skirt steak, flank steak works well in fajitas as well. 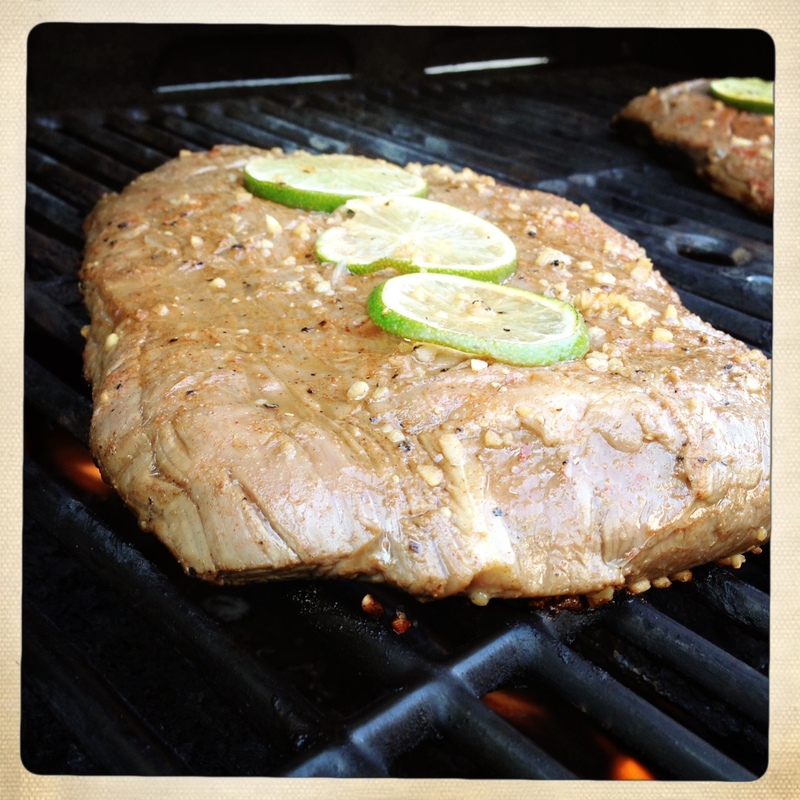 So, get yourself a nice flank steak, and let’s get started! Note: You’ll notice two steaks in all of the pictures because I made this for a large group. The recipe below has been cut down for a single steak, but can easily be doubled or tripled for bigger meals. Because we’re not subjecting this tough steak to low and slow heat to break it down and tenderize it, we’re going to have to do some work up front. First, you want to score the steak on both sides. To do this, lightly run the blade of a sharp knife over the meat in two sets of parallel lines about an inch apart so that you have a diamond pattern. The cuts shouldn’t be more than about an eighth of an inch deep. Do this to both sides of the steak. Next, we’ll be marinating the steak. This will both add flavor and help create a juicier, more tender piece of meat when we grill it. Marinades can be made in limitless combinations of flavors, and it’s easy to do yourself. Marinade mixes and bottled marinades may taste good, but they’re mostly just salt, vinegar and cheap oils. You can build a healthier marinade with much better flavors using simple ingredients you likely already have in the kitchen. You will always want an acid component as well as an oil and some blend of spices, but the flavors are entirely up to you. The lime-based marinade I used for this flank steak is the result of many tweaks and trials, and I think it’s a great complement to the flavor of the steak and a nice place to start when creating your own marinade. For smaller pieces of meat like chicken breasts or pork tenderloins, I marinate in a freezer bag, but with a bigger cut like a flank steak I find a glass baking dish is best. Place the steak into a clean glass dish that will accommodate the meat comfortably. 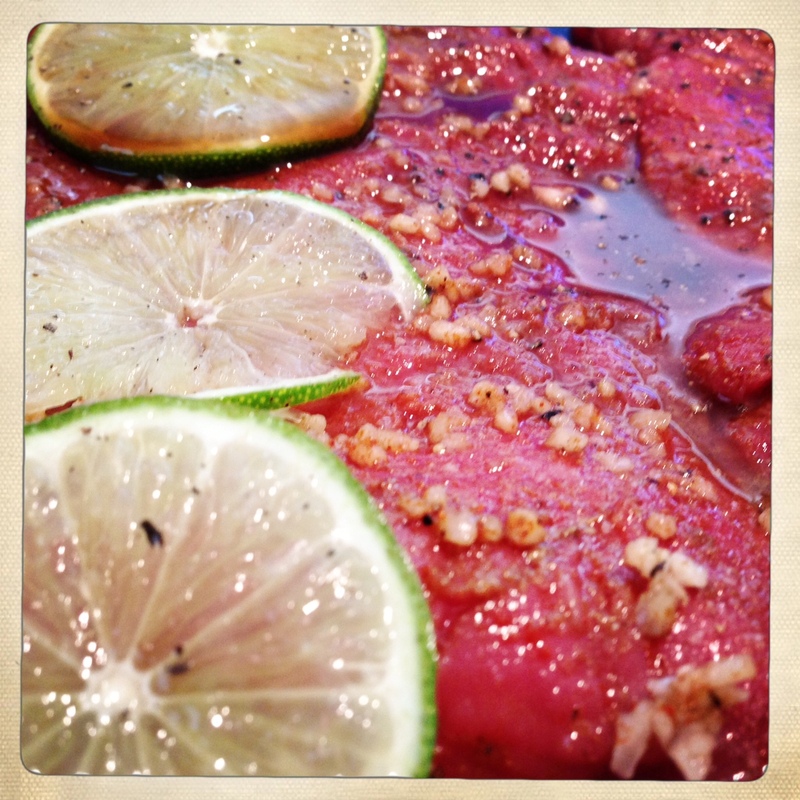 Squeeze the juice of one lime over the meat. Next add the Worchestershire sauce, garlic and a drizzle of olive oil. Turn the meat over a few times to coat both sides and rub the liquid and garlic in a bit with your hands. Season the meat with half the paprika and cumin as well as some salt and pepper. Flip the steaks over and season again with the remaining spices, salt and pepper. 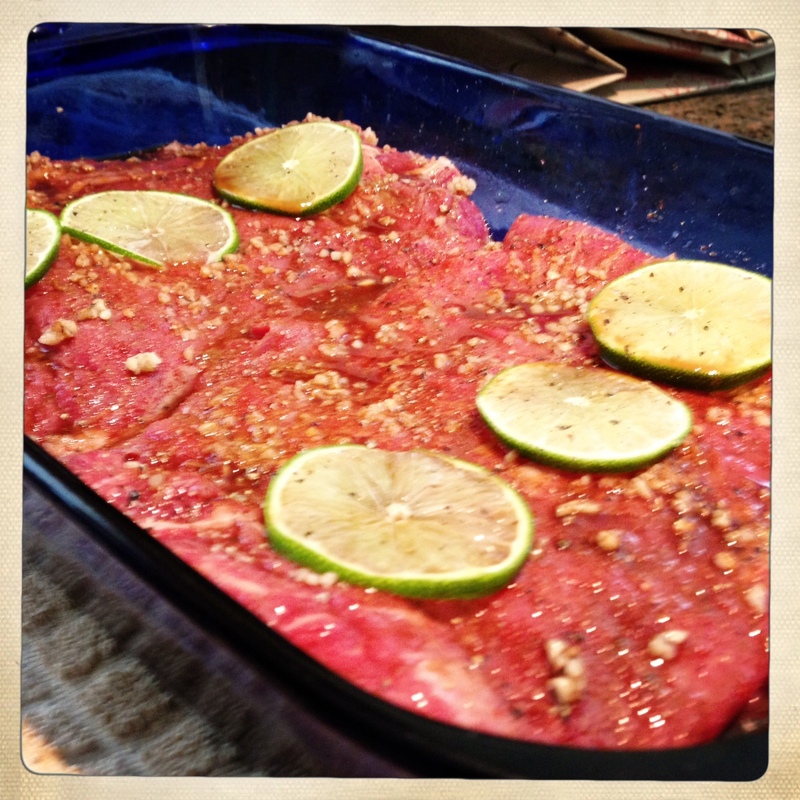 As you can see in the photos, I also slice the second lime and lay the slices on top of the meat. I admit, this is partially for looks when cooking in front of other, but I do leave the lime slices on when I start grilling to get a little more flavor out of them in the early stages of cooking. Let the steak sit in the fridge to marinate for at least an hour. I typically let it sit for about 4-6 hours when I have time, but getting in at least an hour will do wonders for the flavor of the meat. Once you’re ready to cook, get your grill pre-heated a medium-high flame. When you remove the steak from the dish, let the excess marinade drip off, but don’t wipe or pat it dry. Whatever marinade sticks will caramelize on the grill, keeping that great flavor on the meat. Place the steak on the grill and sear for 2-3 minutes over medium-high and then decrease the heat to medium. This will give you nice grill marks early without completely charring the steak before the inside cooks. When it’s time to flip the steaks, pull off the limes and discard them. Flip the steaks and continue to cook until they’re done. 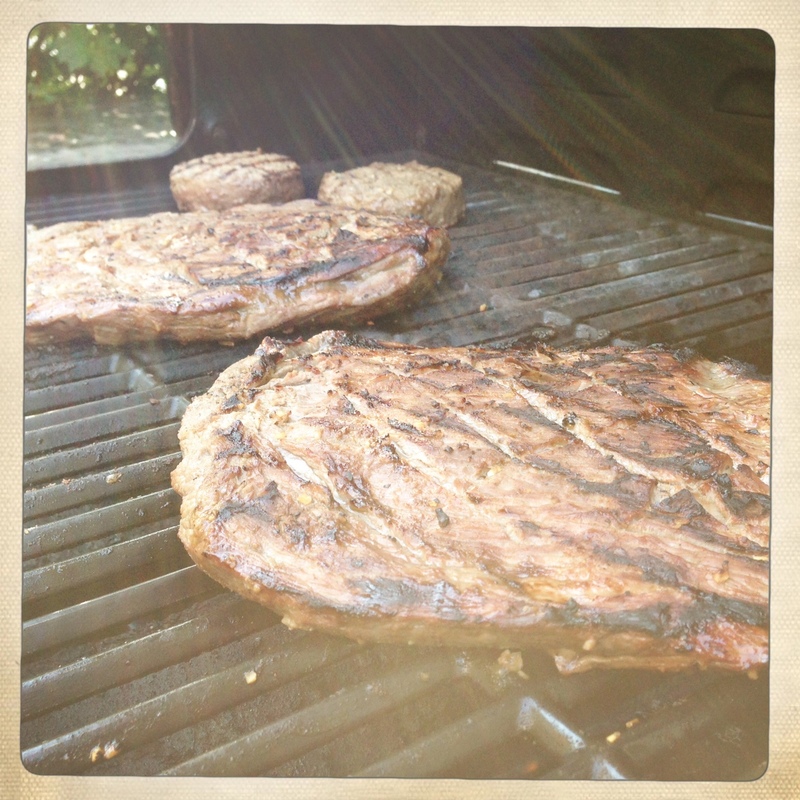 Timing on this can be tricky because flank steaks very in thickness and grill temperatures are not very precise. As a general guideline, I probably go about 6-8 minutes per side, which gets me a mostly medium level of doneness. The thinner portions at the tips will be a little more done and the thicker section will be more rare, but this works well for my family as some prefer more well done and others don’t – everyone is happy with one steak! As mentioned above, don’t forget to hang onto the leftovers. They are delicious cold on a sandwich or a salad – or even just as a snack. 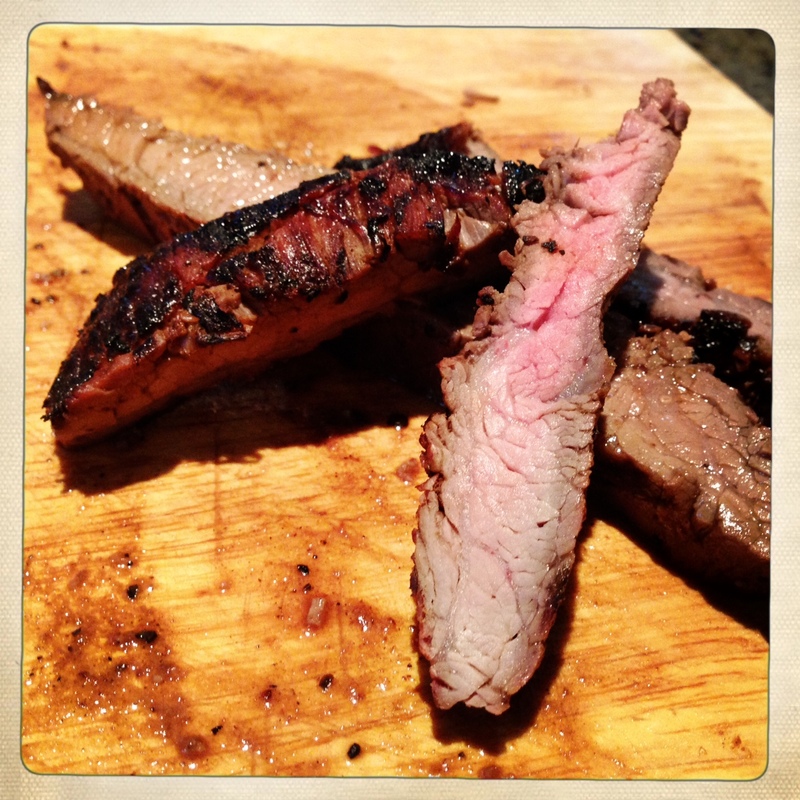 I hope this post gets you started on making your own marinades and helps you see the flank steak as more than just a low and slow cooking cut of meat. Enjoy!